It happens all the time. You're writing a paper or texting a friend and have to ask yourself, "Is it affect or effect? A while or awhile?" Sometimes, even the most seasoned writers have to stop and do a quick Google search to double check themselves. It's hard to deny the fact that the English language has a lot of commonly confused words. They either look alike, sound alike or, worst of all, look and sound alike (but have completely different meanings). If you take a moment to study the commonly confused words below, you might be able to compose your next paper or text without having to stop and chat with Google! The dog's death affected his owners. One of the telltale signs of love is persistent positive affect. The new principal is trying to effect positive change in her students. The manager's attempt to effect (v.) positive change on employee affect (n.) had the unintentional effect (n.) of affecting (v.) punctuality. For more, read Affect vs. Effect: What's the Difference? "All intensive purpose" is an incorrect use of the phrase "all intents and purposes." "All intents and purposes" is a phrase that means "for all practical purposes" or "under most usual situations." For all intents and purposes, she planned to buy the refrigerator but still wanted to check the reviews. Note - "A lot" is always two separate words. "Alot" is not a real word. A while (noun) - for a short time; when "while" is used as the object of the preposition (i.e., for a while), then the "a" is separated from the "while"
Note - Adjectives generally describe nouns, so even if you use the word "bad" following a verb in a sentence, if it's meant to describe the thing itself, then use the adjective. "Bad" here means the same as "rotten," "rancid," or "stinky," all of which are adjectives. For example, "She had a bad taste in her mouth after eating the bad apple." It can also operate under the pretense of being evil, of low quality, damaged, or undesirable. For example, "The writer had a bad back from sitting in a bad chair." If you can replace "bad" with another adjective and still have a sentence that makes sense, then you know that "bad" was the correct choice. Adverbs often describe the manner in which something is done. To say "your feet smell badly" is to say that your feet are inhaling through the nose and perceiving odors, and that they're going about it all wrong. One way to differentiate between the two is to remember that the noun, breath, is pronounced with an EH vowel sound, as in "bed." Meanwhile, breathe is pronounced with an EE vowel sound, as in "sheen." For more, read What's the Difference Between Breath and Breathe? Note - Neither of these phrases is incorrect. The term buck naked may derive from the term buckskin, that from which hides are fashioned. However, neither term has much etymological backing for one being more correct than another. Chomp at the bit - an overused and incorrect form of "champ at the bit"
Champ at the bit (idiom) - ready or anxious; eager to be going or moving along. Could of - an incorrect use of the verb phrase "could have"; when written as a contraction "could've" sounds like "could of." Could have - the past perfect tense of the verb "could"
I could have gone to the play, but I had to study that night. The Thanksgiving turkey is done! For more on participles, check out Participle Examples. For more on the past tense, check out this Past Tense Verb Chart. The teacher discovered illicit drugs in a student's desk. Idiosyncrasy (noun) - any personal peculiarity or mannerism; individual reaction to food or drug. It's a very strange dog. 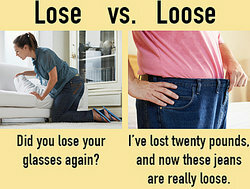 Led (verb) - past tense and past participle of the verb "to lead"
I've lost twenty pounds, and now these jeans are really loose. More/most importantly - a phrase used often in writing to show emphasis; however, many grammarians insist that this is not correct usage. The adverbial ending of -ly is not needed. More/most important - Use this phrase instead. Even more important than that, you need to be nicer to one another. Passed (verb) - past tense of the verb "to pass"
I think we passed the store. Let's turn around and go back. In the past, I've gotten lost a lot, but this time, I know where we are. Principal (noun) - a governing or presiding officer, specifically of a school; (adjective) - first in rank, authority, importance, degree, etc. The student's parents had to have a meeting with the principal. The student's parents thought that they had instilled stronger moral principles in their son. Note - I "seen" the movie three times is not correct though it is commonly used in spoken language. Black Friday sales always bring in the bargain shoppers. Should of - an incorrect use of the verb phrase "should have"; when written as a contraction "should've" sounds like "should of." Should have - the past perfect tense of the verb "should"
I should have gone to the play instead of studying because I failed my test anyway. She didn't properly cite her sources in her essay. Take off all your clothes first. Then, get in the shower. Emily drove up to New York with her then-boyfriend Nick. Let's wait until we're hungry; we can decide what we want to eat then. They're going out to dinner tonight. For more, read Examples of There and Their and Rules for There and Their. I'm going to Baltimore too. I'm too busy. I can't go to Baltimore. For more, check out Grammar Usage: Who Versus Whom. Would of - an incorrect use of the verb phrase "would have"; when written as a contraction "would've" sounds like "would of." Would have - the past perfect tense of the verb "would"
I would have gone to the play except my car wouldn't start. Believe it or not, this isn't a comprehensive list of all the commonly confused words in the English language. But it's a healthy start. If you commit some of these pairs (and triplets) to memory, you'll be ahead of the crowd. A great way to test your knowledge is to dive into this Commonly Confused Worksheet. And if you're feeling really adventurous, take a peek at the 100 Most Often Misspelled Words! "Commonly Confused Words." YourDictionary, n.d. Web. 24 April 2019. <https://grammar.yourdictionary.com/style-and-usage/commonly-confused-words.html>.